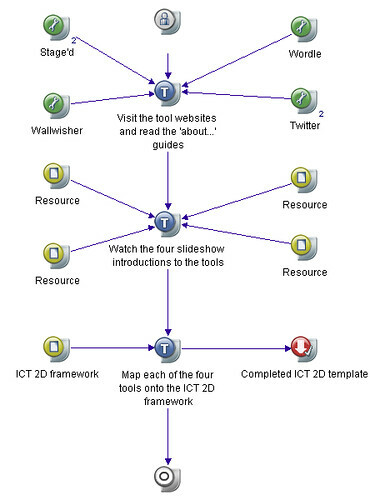 ICT 2D Framework template (se below). How might this exercise help you make decisions about which tools to use in your classroom? Do people perceive the tools in the same way? If not, what factors might change the way we perceive technological tools? The science table looked at stag'd, wall wisher and wordle. we didn't actually looik at twitter in any detail. overall we could see uses for wordle and wall wisher and in fact the 2 could be used together quite neatly. one thing we suggested was to ask for 1 word comments about a module using WW and then these could be compiled using wordle. alternatively issues with the module, topics of difficulty, potential topics for tutorials could all be shared using WW and then compiled using wordle to give an immediate visual representation. maybe stag'd didn't work properly for us but it only seemed to create a single screen which seemed largely pointless to be honest. I personally couldn't see anything that it contributed in addition or instead of any other tool.